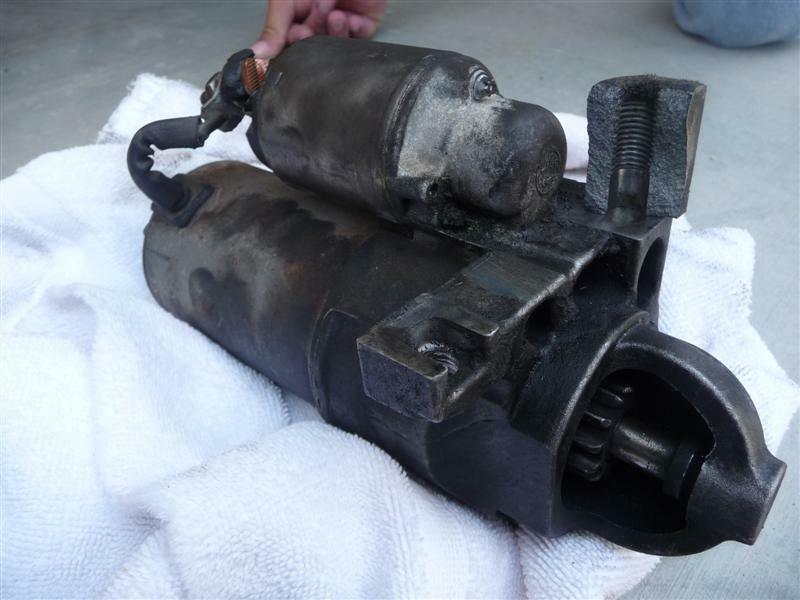 LotusTalk - The Lotus Cars Community > Community > Other Cars and Comparisons > Corvette C5 starter mount failure - welding aluminum engine block? 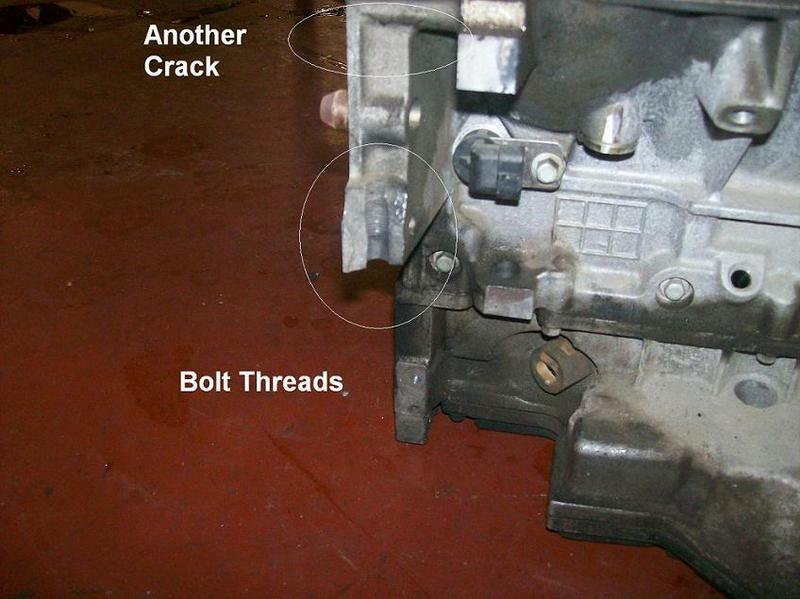 Corvette C5 starter mount failure - welding aluminum engine block? 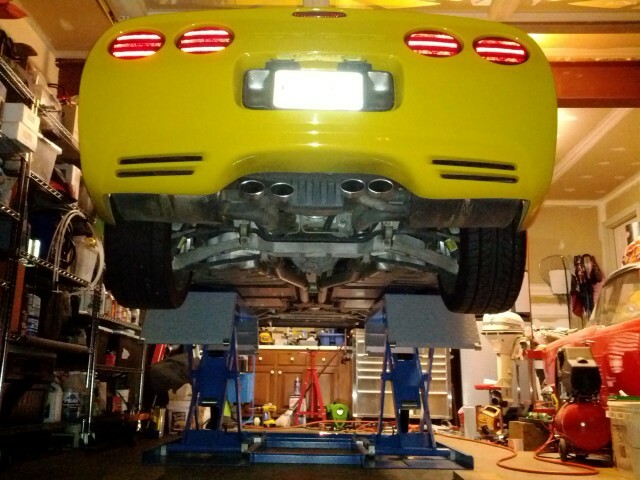 I am helping a friend of mine with his 2002 Corvette C5. This past Monday his wife got in and started it up. It started, but she said it sounded a little funny starting. She backed it out of the garage, but remembered she needed something inside so she shut the car off and ran inside. When she came back out and tried to start it, the starter just made a grinding noise. I told him I would help take a look at it. On Wednesday, we crawled underneath to take a look and could see a crack in the starter housing. 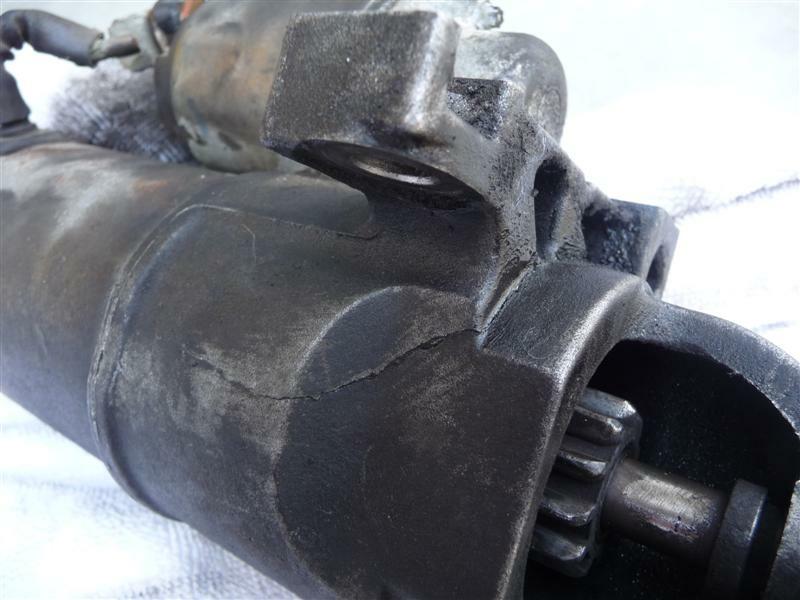 Initially the thought was "oh good, the starter housing cracked and the starter shaft/gear no longer aligned properly with the flywheel ring gear." 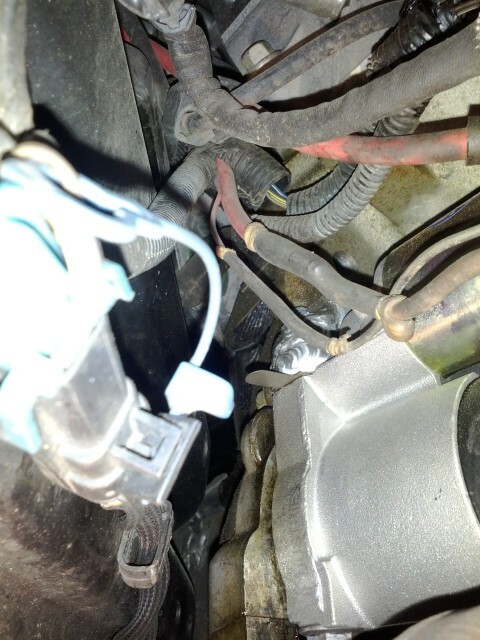 So we proceeded to remove the starter (you have to drop the down pipes to access it). While removing the bolts that hold the starter, a hunk of metal fell out. At first we thought "oh, this part of the starter housing", but upon extracting the starter it became obvious this hunk of metal was the outer part of the ear/flange/support that the starter bolts to. To make matters worse, this is flange is the PART OF THE ENGINE BLOCK. The block is cast aluminum. It is amazing to see this much damage. 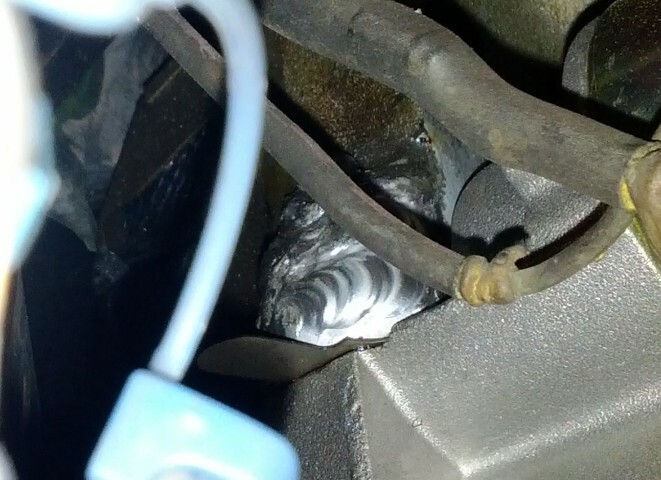 Cracked starter housing AND broken engine block casting. The starter is well protected and would be very difficult for it to have ever been struck by an object when driving. In searching the Corvette forums, there appear to be a couple of others that have had the same thing happen. At least one replace the engine and another had theirs welded (I think this was on an older Corvette that had a cast iron block). So far we have checked several local places (Corvette specialty shops, machine shops, dealers, etc.) and the opinions seem to lean more toward replacing the engine with a few saying it could be welded. Unfortunately, neither option is inexpensive as with the welding, they are saying the engine would have to be removed to get to it. With welding, I also worry about him paying for the removal and replacement of his engine only to find out that the "fix" didn't work. 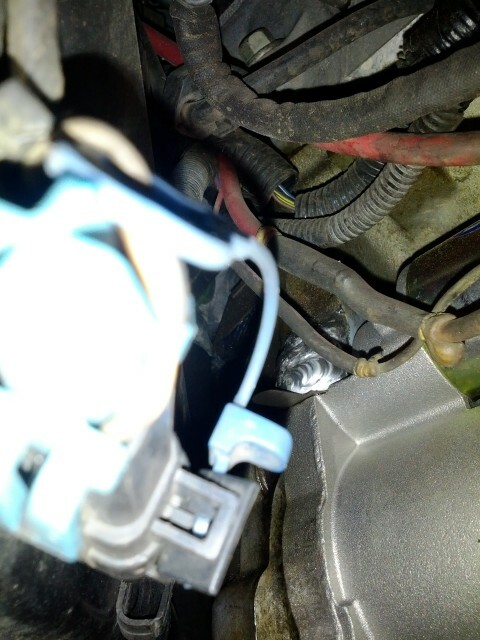 The starter only has two bolts holding it (there is no back bracket or other support). How good of a weld can you get on cast aluminum like this? Would appreciate any recommendations that anyone could offer! JB weld isn't going to cut it in this case! That broken boss and the other crack can be welded, but that isn't going to happen with the engine in the car and possibly not with the engine fully assembed. Once everything is welded, you will then need to have the boss and block precisely remachined and the boss rethreaded to accept the starter bolt. I'm afraid there just isn't an easy or quick way out on this one. On a positive note, this damage can be repaired by welding and it will be a solid repair. Last edited by tesprit; 06-05-2009 at 01:32 PM. 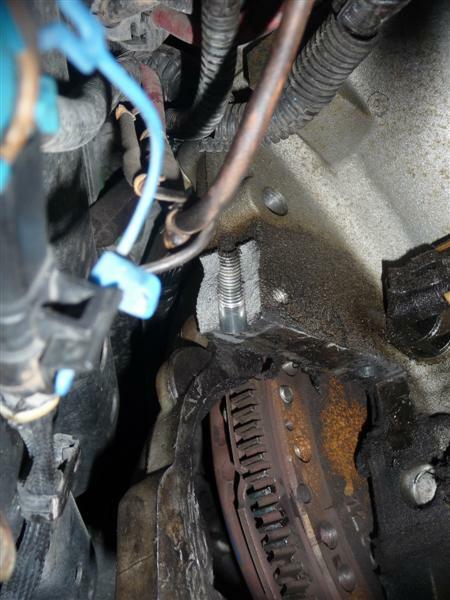 Regardless of how it's repaired, have the ignition system thoroughly checked paying particular attention to the crankshaft position sensor and ignition timing while cranking. 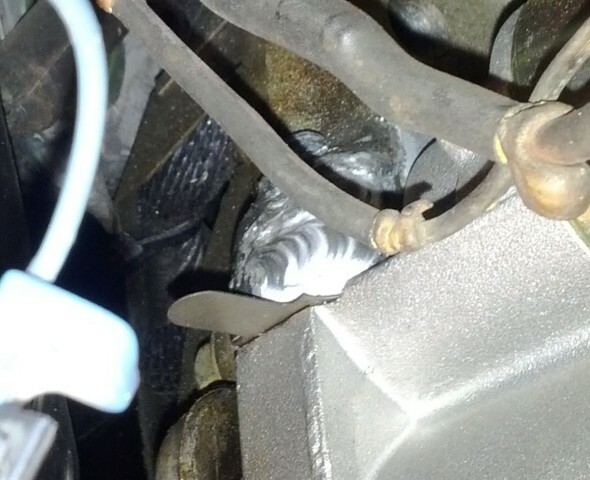 I have seen problems with this putting extra strain on the starter and mounting, usually resulting in a broken starter nose or worst case a broken block like you experienced.....my 2 cents. You must be fast cause you were haulin azz when I passed you!! yeah, you can weld it and it will be as good as oem, and how good was that? I'd guess it'd cost around $500 for a good machine/welding shop to repair it. On the other hand what's the cost of a refurb block and a rebuild. Either way, you'll have to pull the engine. It CAN be welded, I have aluminum race motors that have had multiple "windows" repaired. Its one of the main reasons we use aluminum blocks. I have seen some in chassis repairs you wouldn't believe. Someone who is a VERY good TIG welder can get into some really tight spots and it can be welded overhead. That would be quite difficult to weld especially with all that oil around the area. It would have to be cleaned really well and the bits and pieces conditioned for a good weldment. Engine would have to come out if you expect a weld to be as strong as the factory casting was. Even if it can be welded... Should it? If that broke, then what does that say about the rest of the casting? That block may just be a bad casting... Though maybe they all are! As far as the ignition issue. It's possible but I doubt the ECM is putting that much timing into it during cranking. If there was a failure with the CAS the engine prabably wouldn't fire because the CAS and CMS would be out of phase and would more than likely set a CEL. But who knows? As far as the quality of the casting. Earlier aluminum gen III blocks did suffer from some core shift but that was corrected by 2000 I believe. There are plenty of LS1's making well over 500hp N/A and over 650hp F/I so the rest of the casting should be ok. But, this is a perfect excuse to convince the wife you need a H/C LS3 swap. I'll second the opinion that it can be welded, but you need to find a good shop that knows what they are doing. This isn't like welding new aluminum. Aluminum castings are porous so it will get contaminated over time and will take some treating to get it cleaned up enough to weld. From the photos, it would require the block to be pulled. Well... coming up on 6 months now and the fix is still holding well on my friend's Corvette. He has probably put about 5k miles on it and numerous starts. He decided to go with a Permatex two-part epoxy to repair his Corvette. He had all the work done by a local performance shop (Rusin Performance Solutions). They cleaned the whole area very well and then bonded the broken off piece back on with the epoxy. Once fully cured, they cleaned up the thread with a tap and mounted a new starter (the old starter had cracks in it's housing). Then they fabricated a Z shaped bracket to help support the starter. Rusin Performance did a great job with everything. nice to hear about follow up - more often than not someon shows up, seeks advice and never bothers to to tell everyone if and what worked. Thanks for the update. Yeah, most of the time posties doesn't realize how important it is for them to update what happened to their problem, was it solved and which idea worked best. But anyway, I think their problem can still be solved by a good welder. But normally you shouldn't weld while the engine was still in the car, so it needed more time to weld it. Tig welds can fill up cracks and grooves while Mig Welding should do the rest. Last edited by issabella10; 01-22-2010 at 07:16 AM. Second update... 15 months later now and the repair has just failed. It has been great that it lasted this long though. Especially considering the low cost of the original repair compared to the alternatives (pulling engine to either weld or replace the block). My friend is now evaluating his options again. Last edited by Baysailor; 09-09-2010 at 06:29 AM. Hey Baysailor, thanks a ton for starting this thread and reporting back with the updates. I too am experiencing the same exact failure and your information was very valuable. It is forum members lik yourself who make forums a very valuable resource to the next guy. Maga-thanks again. One question, what did your friend end up doing after the second failure? I just stumbled across this forum. Wish I had seen it in 2008 when I experienced exactly the same problem as Baysailor with my 2000 Corvette with 25,000 miles. I was beside myself, expecially because Chevorlet took to responsibility whatsoever to compensate or even negotiate as solution. The dealer ship, Ed Bozart in Lone Tree Colorado, was great going to bat for me, but absolutely no cooperation nor concern expressed to me by GM. My brother suggested JB Weld and the dealership agreed to do it with no guarantees. That was April 2008. Monday Sept 1, 2012 if failed. Now I'm back to square one, but now with 43,000 miles on a mostly pefect car and engine. I'm open to any and all solutions, but I don't think having to pay 100% of a $9,000 dealer engine replacement should be one of them. What is a gen 33 aluminim block. Shouldn't GM be responsible in some way for these block failures? Junkman2008, what did you do to solve your problem. Baysailor, did your friend find an option? ^weld it. ran into a similar circumstance, ended up having it welded throughout and using a truck starter. the truck starters mounting tabs are equal length so they see the torque distributed evenly. the outer mounting tab on ls1's, etc were shorter, and saw more torque, hence why they break off. Sorry for being so delinquent in updating this post! My friend still has his Corvette that suffered the broken engine block flange that the starter bolts to. Jun 2009 - "Glued" piece back in place with Permatex 2 part epoxy. Sep 2010 - Permatex failed after 15 months. Sep 2010 - "Re-Glued" part on using JB Weld 2 part epoxy. Nov 2011 - JB Weld failed after about 14 months. After the failure in November of 2011, my friend found a guy that thought he could weld the block without having to remove the engine. I think it was January 2012 that he did the repair. 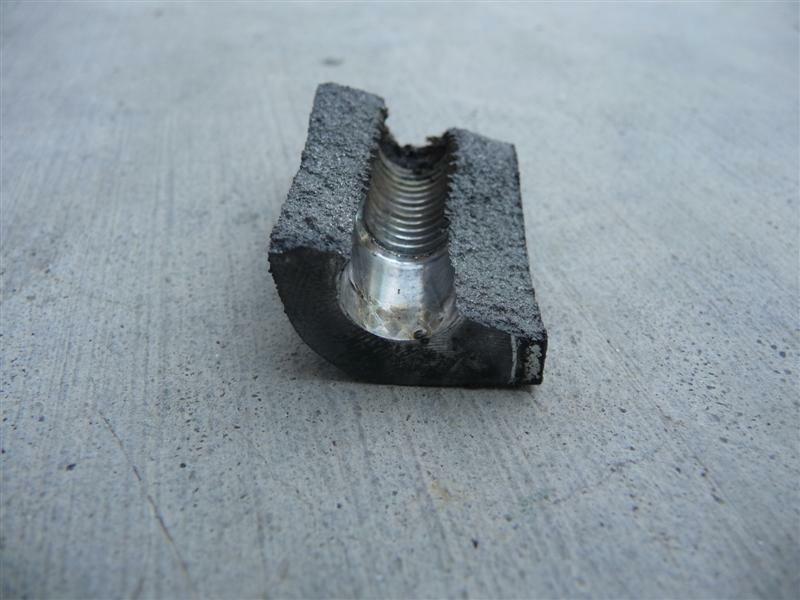 He was not able to weld the broken piece back on as there was no room on the backside of the flange to weld with the engine in the car. What he ended up doing is running rows of welds on the flange where the broken piece would have gone. He kept doing this until he built-up enough material. He then ground the mating surface on the bottom fairly flat, drilled a new hole and tapped it. Everything worked out pretty well, expect I don't think the starter lines up quite right now. When you start the car, it definitely sounds different. Not quite right, but not too bad. Kind of hard to explain. Last edited by Baysailor; 11-02-2012 at 09:11 AM.